Puppies, puppies and more puppies! We love everything dog in this house so when the Pound Puppies released Holiday Hijink we knew it was going to be a hit with my daughter. Holiday Hijinks has 4 short episodes rolled into one DVD which make perfect watching for children of all ages. This was definitely a cute watch and an add to the Christmas list movie! On DVD November 5, 2013! The holidays are here and no one is more excited than these loveable Pound Puppies! On November 5th, 2013, Shout! 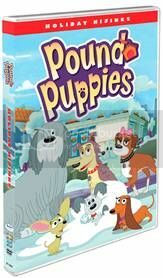 Factory Kids, in collaboration with Hasbro Studios, will release Pound Puppies: Holiday Hijinks on DVD. Can the Pound Puppies gang — Lucky, Niblet, Cookie, Strudel, Squirt and Mr. Nut-Nut — make sure that every pet has a family of their very own this holiday season? Find out in this merry-filled disc, packed with five of your all-time favorite holiday episodes!